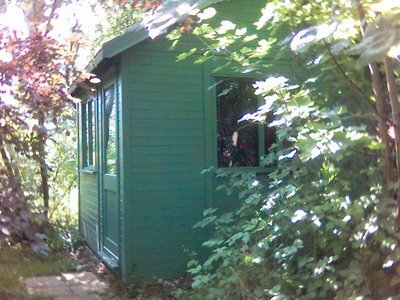 Man in a Shed: Has Gordon Brown sworn to favour Scotland ? Has Gordon Brown sworn to favour Scotland ? The CEP has a timely post that suggest Gordon Brown is either an oath breaker or unable to become a fair prime minister of the United Kingdom. Now we know Scotland will be favoured by the NuLabour, as it has been in terms on finance, and constitutional arrangement plus the attempt by Labour to destroy the English nation with its regionalism agenda. But here we have a bind that shows that Gordon Brown is either dishonest or deceitful. ( you can of course have both ). 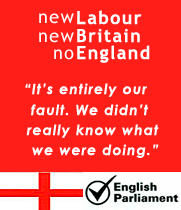 England is again the victim of the Celtic socialists of Labour and the Lib Dems. ( I'll give the SNP credit as at least their view point is fair and reasonable for the English ). See also: Tartan Hero who says "Now the Clunking Fist has a strong habit of forgetting about anything he agreed to, believed in or said before becoming the Iron Chancellor in 97..."
I've also blogged on this under the theme of democracy - EU and English votes decisions both a bit devoid of democracy I would say.